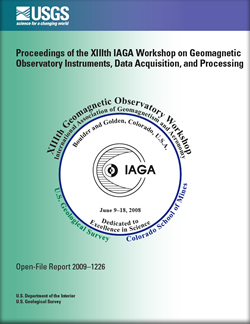 The thirteenth biennial International Association of Geomagnetism and Aeronomy (IAGA) Workshop on Geomagnetic Observatory Instruments, Data Acquisition and Processing was held in the United States for the first time on June 9-18, 2008. Hosted by the U.S. Geological Survey’s (USGS) Geomagnetism Program, the workshop’s measurement session was held at the Boulder Observatory and the scientific session was held on the campus of the Colorado School of Mines in Golden, Colorado. More than 100 participants came from 36 countries and 6 continents. Preparation for the workshop began when the USGS Geomagnetism Program agreed, at the close of the twelfth workshop in Belsk Poland in 2006, to host the next workshop. Working under the leadership of Alan Berarducci, who served as the chairman of the local organizing committee, and Tim White, who served as co-chairman, preparations began in 2007. The Boulder Observatory was extensively renovated and additional observation piers were installed. Meeting space on the Colorado School of Mines campus was arranged, and considerable planning was devoted to managing the many large and small issues that accompany an international meeting. Without the devoted efforts of both Alan and Tim, other Geomagnetism Program staff, and our partners at the Colorado School of Mines, the workshop simply would not have occurred. We express our thanks to Jill McCarthy, the USGS Central Region Geologic Hazards Team Chief Scientist; Carol A. Finn, the Group Leader of the USGS Geomagnetism Program; the USGS International Office; and Melody Francisco of the Office of Special Programs and Continuing Education of the Colorado School of Mines. We also thank the student employees that the Geomagnetism Program has had over the years and leading up to the time of the workshop. For preparation of the proceedings, thanks go to Eddie and Tim. And, finally, we thank our sponsors, the USGS, IAGA, and the Colorado School of Mines. Love, J.J., ed., 2009, Proceedings of the XIIIth IAGA Workshop on geomagnetic observatory instruments, data acquisition, and processing: U.S. Geological Survey Open-File Report 2009–1226, 271 p.